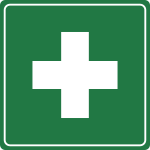 First Aid is the provision of limited care for an illness or injury, which is provided, usually by a lay person, to a sick or injured person until definitive medical treatment can be accessed, or until the illness or injury is dealt with (as not all illnesses or injuries will require a higher level of treatment). It generally consists of series of simple, sometimes life saving, medical techniques, that an individual, either with or without formal medical training, can be trained to perform with minimal equipment. The Knights Hospitaller were probably the first to specialize in battlefield care for the wounded. Similarly, knights founded the Order of St. John in the 11th century to train other knights specifically how to treat common battlefield injuries. St. John Ambulance was formed in 1877 to teach first aid (a term devised by the order) in large railway centres and mining districts. The order and its training began to spread throughout the British Empire and Europe. As well, in 1859 Henry Dunant helped organize villagers in Switzerland to help victims of the Battle of Solferino. Four years later, four nations met in Geneva and formed the organization which has grown into the Red Cross. Developments in first aid and many other medical techniques have been fueled in large by wars: the American Civil War prompted Clara Barton to organize the American Red Cross. Today, there are several groups that promote first aid, such as the military and the Scouting movement. New techniques and equipment have helped make today's first aid simple and effective. In addition, some trainers may also advocate a 4th 'P' - Protect yourself, although this is not technically an 'aim' of providing first aid, and some people would consider that it is adequately covered by 'Prevent further injury' as this is to the casualty, yourself or others. However, effective life saving first aid needs hands-on training by experts, especially where it relates to potentially fatal illnesses and injuries, such as those that require Cardiopulmonary resuscitation (CPR), as the procedures may be invasive, and carry a risk of further injury to the patient - which the '3 aims' of first aid above, clearly try to avoid. As with any training, it is more useful if it occurs before an actual emergency, although in many countries, emergency ambulance dispatchers will give basic first aid instructions over the phone whilst the ambulance is on its way. Training in first aid is often available through community organizations such as the Red Cross and St. John Ambulance, or through commercial providers, who will train people for a fee. This commercial training is most common for training of employees to perform first aid in their workplace. Many community organisations, such as the ones above, also provide a commercial service, which complements their community programmes. There are certain skills which can be regarded as core, regardless of where or how first aid is taught. These should always be treated in the order of priority, usually given by the "3 B's"
In order to preserve life, all persons require to have an open airway - a clear passage where air can move in through the mouth or nose through the pharynx and down in to the lungs, without obstruction. Conscious people will maintain their own airway automatically, but those who are unconscious (with a GCS of 3) may be unable to maintain a patent airway, as the part of the brain which normally autonomously controls this, may not be functioning. If an unconscious patient is lying on their back, their tongue may fall back, obstructing the oro-pharynx (sometimes incorrectly called 'swallowing the tongue'. This can be easily rectified by a first aider tipping the head backwards, which mechanically lifts the tongue clear. Once the airway has been opened, the first aider would assess to see if the patient is breathing. If there is no breathing, or the patient is not breathing normally, such as agonal breathing, the first aider would undertake what is probably the most recognised first aid procedure - Cardiopulmonary resuscitation or CPR, which involves breathing for the patient, and manually massaging the heart to promote blood flow around the body. Some first aiders or first aid organisations may also use the Star of Life device, although this is more often associated with professional Ambulance crews. In the United Kingdom, there are two main types of first aid courses offered. An "Emergency Aid for Appointed Persons" course typically lasts one day, and covers the basics, focusing on critical interventions for conditions such as cardiac arrest and severe bleeding, and is usually not formally assessed. A "First Aid at Work" course is a four-day course (two days for a requalification) that covers the full spectrum of first aid, and is formally assessed. Certificates for the "First Aid at Work" course are issued by the training organisation and are valid for a period of three years from the date the delegate passes the course. Other courses offered by training organisations such as St John Ambulance, St. Andrew's Ambulance Association or the British Red Cross include Baby & Child Courses, manual handling, people moving, and courses geared towards more advanced life support, such as defibrillation and administration of medical gases such as oxygen & entonox). Level 1 (or Basic First Aid): Covering CPR, severe bleeding and protection of injuries such as broken bones. It typically lasts 1 day. Level 2 First Aid (Intermediate First Aid) is a 2 day course that covers all the aspects of training in Level 1, as well as specialised training for treatment of burns, bites, stings, electric shock and poisons. Level 2 re-accrediation is a 1 day course which must be taken every 3 years. Level 3 First Aid is a 5 day course, and suitable for workplace First Aiders and those who manage First Aid facilities. Other courses outside the general curriculum and levels can also be sought, including Administering Medications (such as the Epi-Pen, Defibrillation and CPR-only courses. In Ireland the workplace qualification is the Occupational First Aid Certificate which is validated by the National Ambulance Training School. They hold the register of all Instructors/Examiners. The certificate is awarded after a three day course and is valid for three years from date of issue. Organisations offering the certificate include; the Irish Red Cross, Order of Malta, LTS First Aid Specialists, and the St John Ambulance. Battlefield First aid - After the 9-11 terrorist attack, this protocol refers to treating shrapnel, gunshot wounds, burns, bone fractures, etc. as seen either in the battlefield or in the affected area resulting from a terrorist attack. Cramps in muscles due to lactic acid buildup caused either by inadequate oxygenation of muscle or lack of water or salt. Diving disorders resulting from too much pressure. Gender specific conditions, such as Dysmenorrhea and Testicular torsion. Hemorrhage, or heavy bleeding, treated by applying pressure (manually and later with a pressure bandage) to the wound site and elevating the limb if possible. Hypothermia, or exposure, occurs when a person's core body temperature falls below 33.7°C (92.6°F). First aid for a mildly hypothermic patient includes rewarming, but rewarming a severely hypothermic person could result in a fatal arrhythmia, an irregular heart rhythm. Sprain, a temporary dislocation of a joint that immediately reduces automatically but may result in ligament damage. Sucking chest wound, a life threatening hole in the chest which can cause the chest cavity to fill with air and prevent the lung from filling, treated by covering with an occlusive dressing to let air out but not in. Toothache, which can result in severe pain and loss of the tooth but is rarely life threatening. Wounds and bleeding, including laceration, incision and abrasion, and avulsion. ↑ First Aid: From Witchdoctors & Religious Knights to Modern Doctors, retrieved December 10, 2006. ↑ Industrial Revolution: St. John Ambulance, retrieved December 10, 2006. ↑ American Red Cross -- Museum, retrieved December 10. 2006. This page was last edited on 20 October 2016, at 23:35.